Sweet cherry tomatoes are tossed with olive oil, garlic, and balsamic vinegar before hitting the oven. 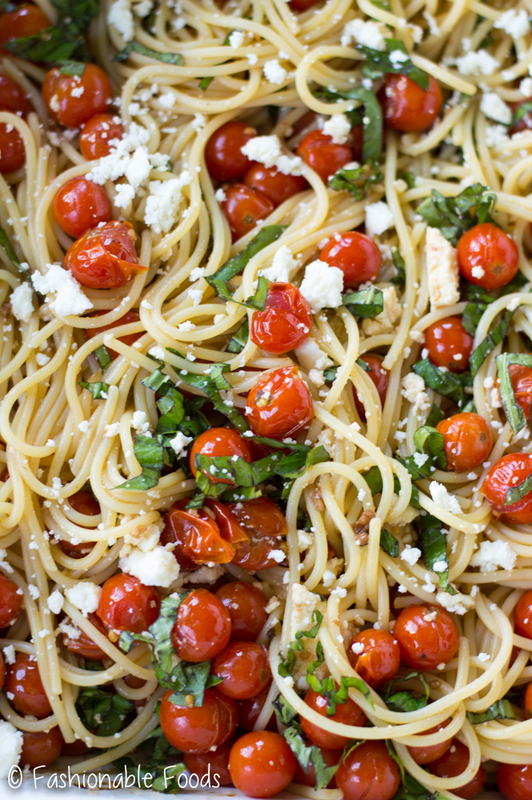 This vibrant roasted cherry tomato pasta is quick, easy, and will quickly become a family favorite! It’s Monday. Again. I seem to say this every week, but it seems like it’s always Monday! For many families it’s a big Monday since a lot of schools begin the new year today. Around here school actually started last week, but back where I grew up the first day is today. Back-to-school always means busy, busy, busy! The first few weeks can be hectic trying to get into a routine, so it’s nice to have a few go-to meal options that are quick and easy. Enter today’s recipe! 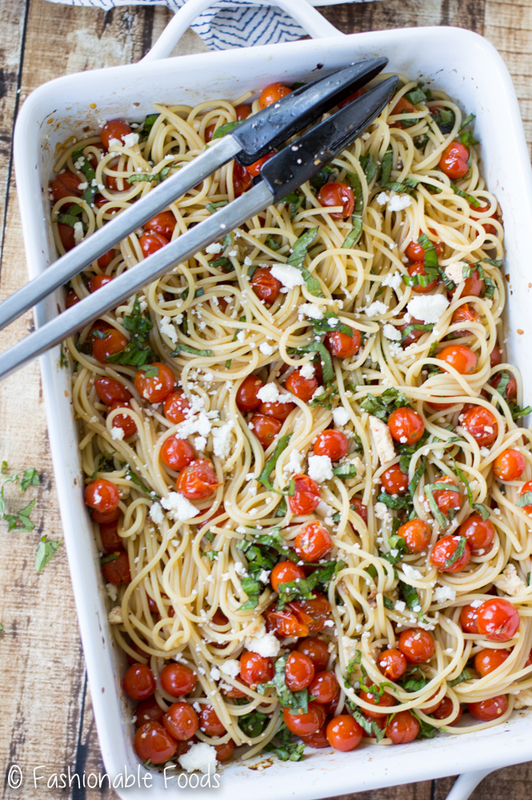 Roasted cherry tomato pasta has been my go-to meal for YEARS. I actually can’t believe it has taken me this long to share it, but it’s just one of those things that I mindlessly make. 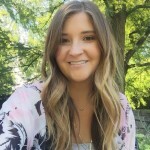 It really never crossed my mind to share it on this blog until recently. A few weeks ago my in-laws were here for a visit and I made this pasta. They loved it and asked if I had it on the blog. I knew right then that I had to share it with you guys! 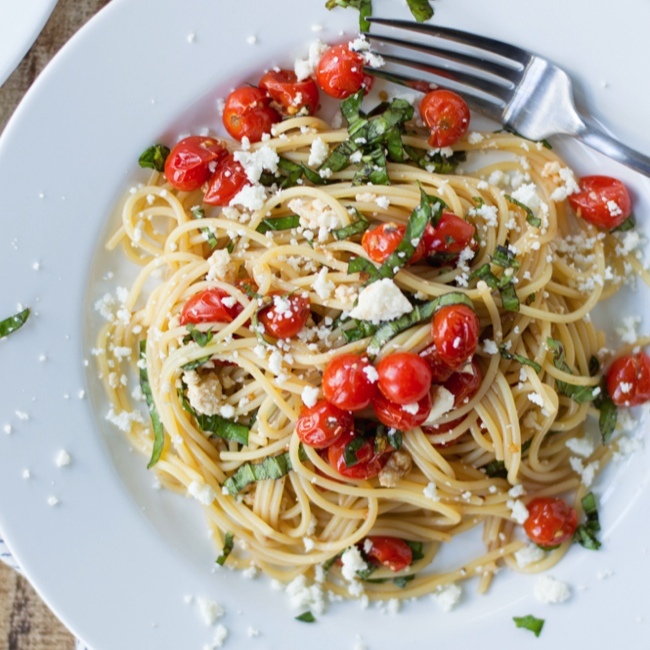 Not only is this roasted cherry tomato pasta simple and quick, but you need minimal ingredients and dishes! That right there is what makes it such a great weeknight meal. 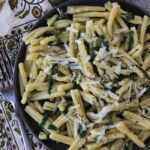 This pasta dish was my go-to meal in college, so much so that I made it once a week. The leftovers are phenomenal hot or cold, so it’s also perfect for packing in your lunch! I’ve had no shortage of cherry tomatoes in my garden and they are all over the farmer’s markets right now, too! If you can find sweet 100’s I HIGHLY recommend them! Sweetest cherry tomatoes EVER. If you can’t find them, just use whatever you find – cherry or grape tomatoes work wonderfully. This delicious pasta starts out by mixing the tomatoes with some garlic, olive oil, and balsamic vinegar before heading into the oven. Then, they roast just until they start to burst open. The balsamic vinegar sweetens up during the roasting process making the absolute perfect sauce for pasta! While the tomatoes are roasting, you’ll boil up some pasta. You can use whatever pasta you like, but I do recommend using a long cut like spaghetti, fettuccine, or linguine. I like the way the longer cuts soak up the sauce and make it easy to twirl in the tomatoes and cheese. My favorite part of this dish is that you can toss the pasta directly into the roasting pan you used for the tomatoes, making cleanup minimal! Now, let’s talk about the cheese. The whole reason this pasta came to be was the cheese. Back in college I went through an obsessive period with ricotta silata cheese. I bought a wedge every week and used it to top all kinds of pastas and salads. Prior to this pasta, my go-to was a caprese-style dish made with mozzarella. 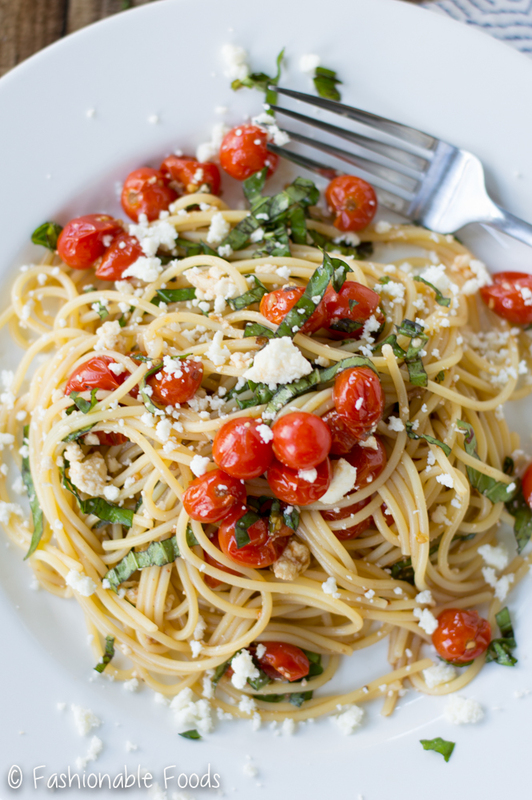 I sauté tomatoes with garlic and then toss with pasta, mozzarella, and fresh basil. Well, one day I was feeling lazy and didn’t want to stand over the stove. I decided to roast the tomatoes and add balsamic vinegar to create more of a sauce. I didn’t have any mozzarella, but had my beloved ricotta silata, so that’s what I used. Boom. My new go-to dish was born. The moral of that little story is, I really like this with the ricotta silata cheese, but I know that can be a hard one to find. I can’t find it anywhere around here, so I use cojita cheese or queso fresco. 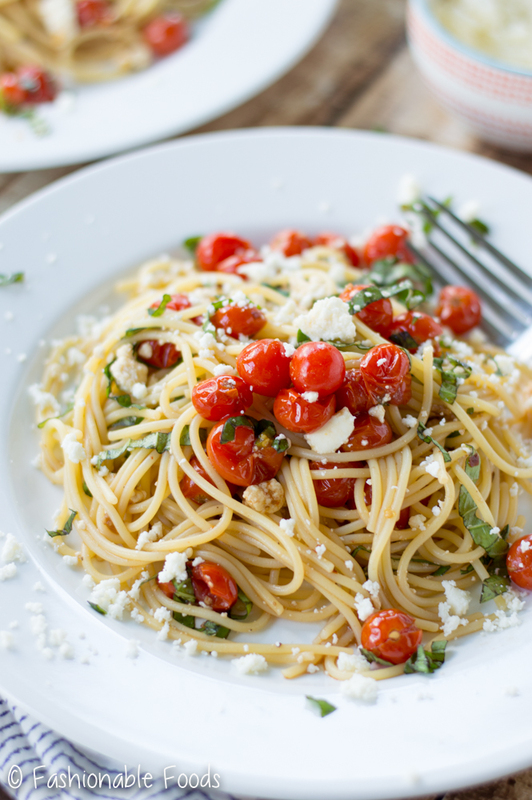 Those are pretty similar cheeses and give the same characteristic to this pasta dish. If you aren’t into crumbly cheeses, you can use cubed fresh mozzarella. Or, you could even just grate some fresh parmesan on top. I do highly recommend going the crumbly cheese route, though! ? Well there you have it! 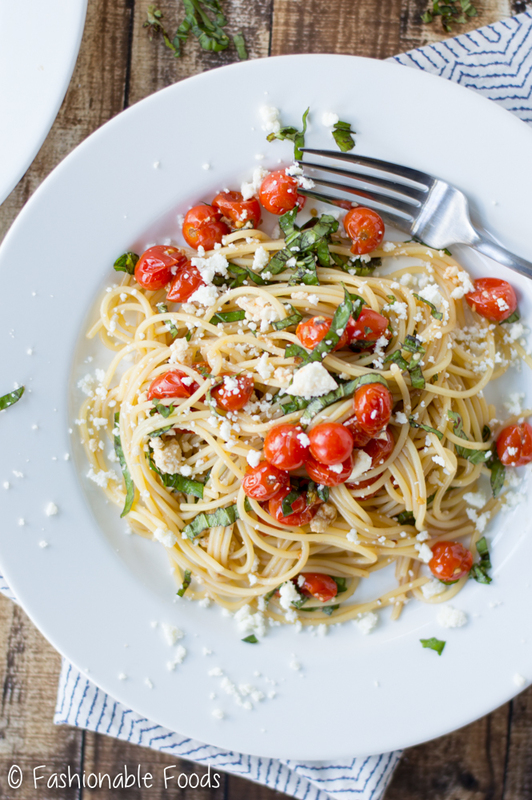 A simple, quick, and tasty pasta dish that’s perfect for busy weeknights. I recommend making it now while perfect tomatoes are everywhere! However, I will mention making this pasta in the winter with tart, or not so sweet tomatoes is very possible. All you have to do is add a few pinches of brown sugar to the mix before roasting. It may not be quite as good as it would be now, but it’s still fabulous! 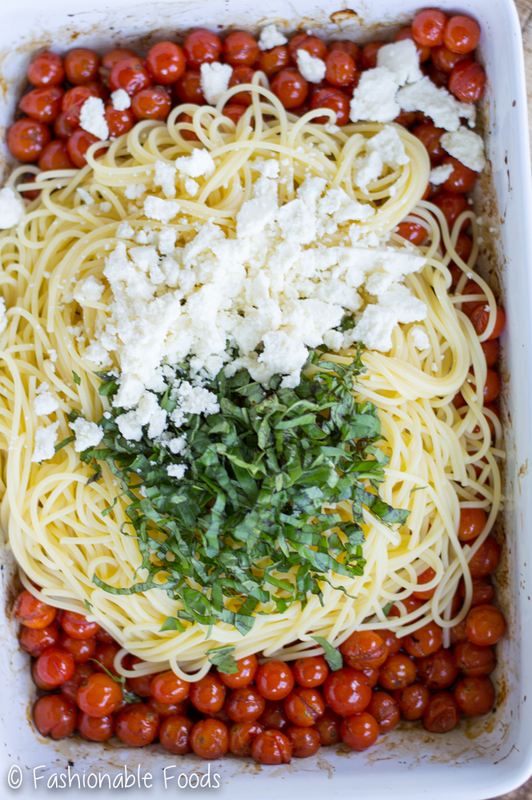 Place the cherry tomatoes in a 9x13 inch baking dish and top with garlic, balsamic, and olive oil. Season the mix with salt and pepper and stir to combine. 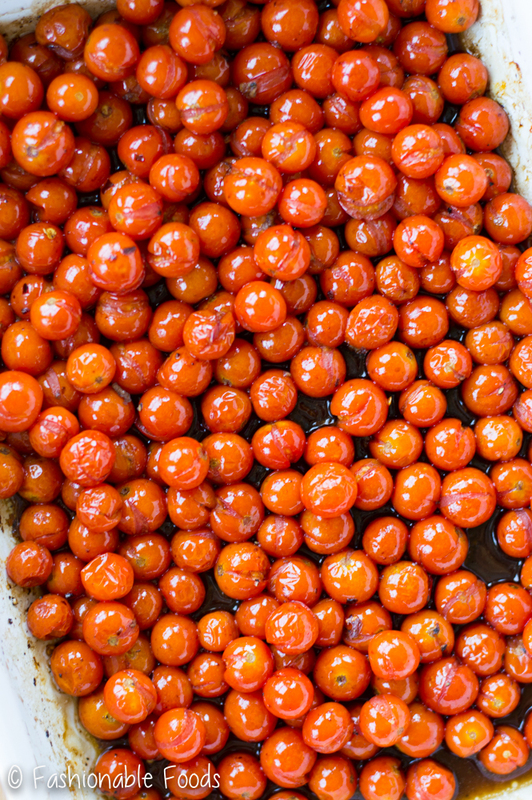 Roast the cherry tomatoes for 15-20 minutes, or until they just start to burst. Toss the pasta right in the pan with roasted cherry tomato sauce, adding pasta water if you need more moisture. Add in the cheese and basil while tossing. Serve the pasta with a drizzle of extra-virgin olive oil. *My favorite gluten-free spaghetti is Barilla. If you’re not gluten-free, simply use traditional pasta; just be mindful that a box of regular pasta is 16 oz. and this recipe is formulated for a 12 oz. box of gluten-free pasta! *Ricotta Silata cheese is a dry crumbly cheese that is pretty mild, but has a salty bite. If you can’t find it, you can use Queso Fresco or Cojita cheese, which I find to be extremely similar in taste and texture! *I always rinse gluten-free pasta as it prevents it from being too sticky and starchy. Omit the rinsing if you’re using traditional pasta! Oh my gosh – this looks SO good. How in the world did you photograph pasta so beautifully? I always have the hardest time with that! I seriously want to ditch work right now, go to the grocery store, and buy the stuff to make this! It doesn’t help that it’s right before lunch… :). Aw thank you for the sweet comment, Annie! Honestly I think the photo gods were with me because I always struggle with photographing pasta, too! I hate when I read food blogs right before a meal, I swear I end up eating twice as much food because they make me so darn hungry! 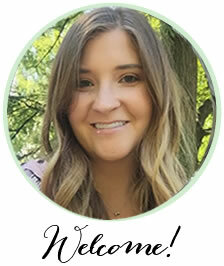 I love the fresh flavors in here, Keri! I have a feeling this would quickly become my favorite pasta. Can you believe I’ve never roasted tomatoes before? I definitely need to try this out. 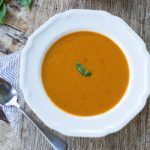 Sounds perfect for an easy lunch or dinner! Thanks, Gayle! You HAVE to try roasting tomatoes – it’s SO easy and they get the best flavor! Wow! The color of those cherry tomatoes look so vibrant! And this pasta looks wonderful, Keri. Simple, easy and exotic. Looks way better than the restaurant ones.. amazingly yummilicious! ? I am making this dish tonight. Can’t wait. I just made this dish. Love it. i love the way you took its photos. seems very healthy and fresh for a Fall day. 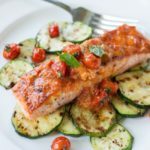 My kids don’t really love tomatoes but i believe they will love this dish. trying it out tomorrow. thanks for sharing , friend. This looks so great. I really like the combination of colors of this recipe, really nice. 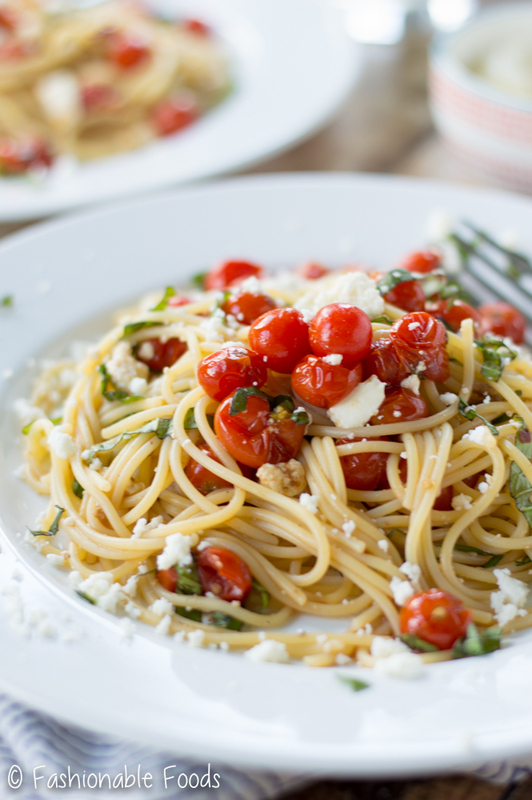 Love eating cherry tomato, and think that this recipe is tasty. Thanks for sharing, Keri.